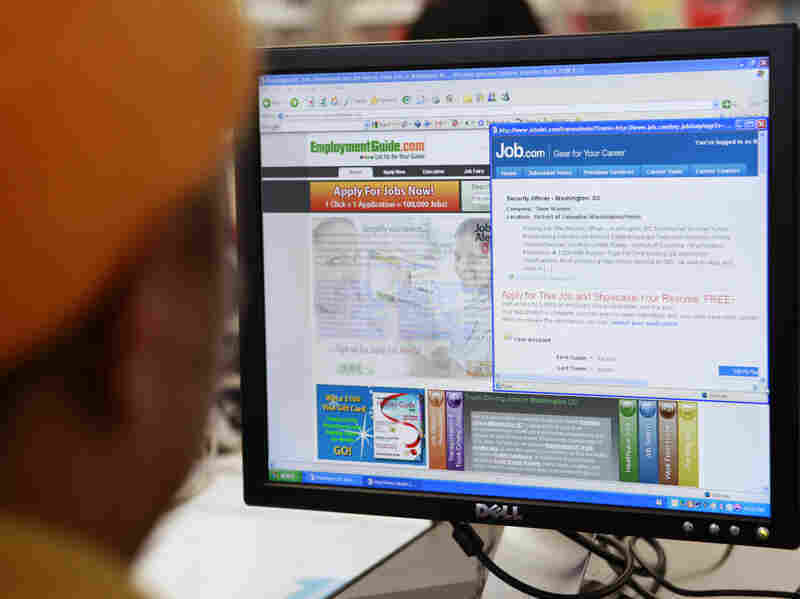 Job Applicants Are Wary Of Firms' Resume Sorting Software Some big companies are using talent management software to narrow the pool of job applicants before an employer reviews the resumes. Human resources officials say in today's economy, the systems are crucial. But employment seekers often find the software puts them at a disadvantage. Companies rely on software to search for new employees, especially when there's a large number of job applicants. But those seeking employment say it puts them at a disadvantage when the software hones in on key terms that don't fit on their resumes. With unemployment still high, hiring managers continue to be inundated by job applications. Some big companies are coping with the deluge by using talent management software that winnows pools of job applicants before a human lays eyes on their resumes. Human resources teams say in today's economy, the systems, which have been around for decades, are crucial. But job hunters like Tim Woodfield often find the software overly aggressive. Woodfield is an information technology expert, but, ironically, computers became his nemesis during his job search. He was out of work for about a year and applied for dozens of IT management positions in Minnesota's Twin Cities. He said his resume often failed to make it past the companies' software systems. The software typically screens for keywords from a job description. "If there's 25 bullet points, you've got to hit all 25," Woodfield says. "So if you miss one or two, they're going to catch you on it and somebody else is going to get the interview." Forget the old days when you'd print your application materials on nice, thick resume paper and mail it in. These days, you usually apply online. At the start of the process you create an account. And then you might be asked how much weight you can lift and if you're a convicted felon. After, assuming that the software overlords are satisfied with your answers, you can submit your resume. In case the right skills are there, the software will then rank you against other candidates. If not, you'll likely get an auto-generated email rejecting your application. Woodfield tried to outwit the software with another software program — Wordle, which can identify the key concepts from job descriptions. He would then frontload keywords like "project management" and "IT infrastructure" into his resume. He and other job seekers have complained that the candidate management software creates too many hoops to jump through. "There's no way possible you can have all the buzzwords, or your resume is six pages long," Woodfield says. He ended up getting a job the old-fashioned way — through networking. Elaine Orler, a talent acquisition consultant in San Diego, says candidate management software can be really helpful for big companies that can afford it. Several years into the economic recovery, unemployment is still high, and job openings are limited. "Where they used to hire 10 they can only hire two in this economy," Orler says. "You've now got 1,000 people fighting for two [jobs]. By default, more people will be rejected." And many of those applicants are totally unqualified. Ann Costello, a recruiter at Venteon Finance near Minneapolis, thinks the requirements for drawing unemployment benefits, which include applying for multiple jobs, are causing people to go on application sprees. Costello sees bartenders and line cooks vying for high-level accounting jobs. She figures it's because they're looking to check the box on their unemployment paperwork that shows they're trying to get a job. "I was opening up these resumes and just shaking my head, because it requires a college degree," Costello says. "I've probably got 20 applicants who don't have a college degree." In those cases, she says, candidate management software is helpful. But she concedes it may sometimes cut too deeply into the talent pool, eliminating candidates who didn't use the right buzzwords. "How can you get to a point where you feel like you're screening out the people you don't want to see and not the people you do? And there's no perfect answer for that, because it's a computer," she says. But, Costello notes, humans are fallible, too. If hiring managers had to sit down and sort through hundreds of applications by hand, they might not fare much better.